The Vertiv XTE 601E Sole Enclosure offers thermal management, battery backup and room for wireless carrier equipment to meet your small cell application needs. The Vertiv XTE 601E Series is a full featured modular line of outdoor enclosures ideal for use in macro cell site and C-RAN applications. Vertiv XTE 601E equipment enclosures are designed to house DC power, network electronics and battery backup equipment in a single enclosure. 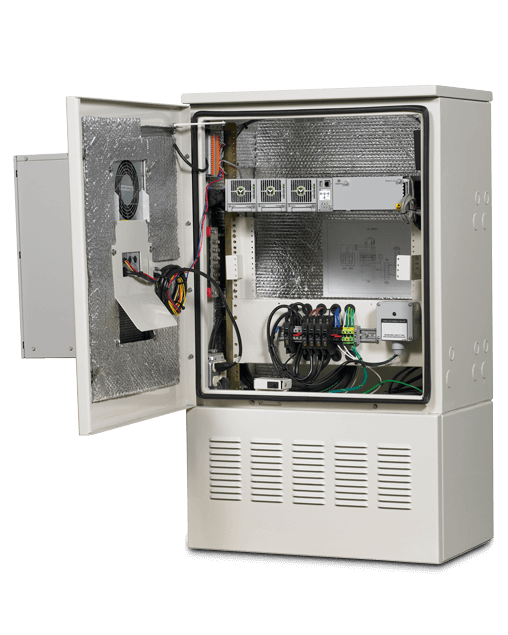 To provide maximum protection for your equipment investment, 601E enclosures are built and tested to withstand extreme environmental conditions. Electronics and batteries are kept at proper operating temperature by either a door mounted heat exchanger (HX) or an air conditioner, depending on the model. Two Thermal Electric Coolers (TECs) manage battery temperature on the HX version. An environmental controller maximizes cooling effectiveness, while minimizing energy usage and noise. An optional externally-mounted overvoltage protection (OVP) unit accommodates up to (3) OVP indoor shelves and includes a 20-position DC distribution shelf, sealed hybrid cable entry, fiber storage, and an alarm block. This frees up equipment space in the main enclosure and prevents tower technicians from accessing the batteries and network electronics.